The 6th Edition Barrio Writers, A Collection of Works by Teens for Teens, Teachers & Our Communities is the first edition to be published by SFA Press! 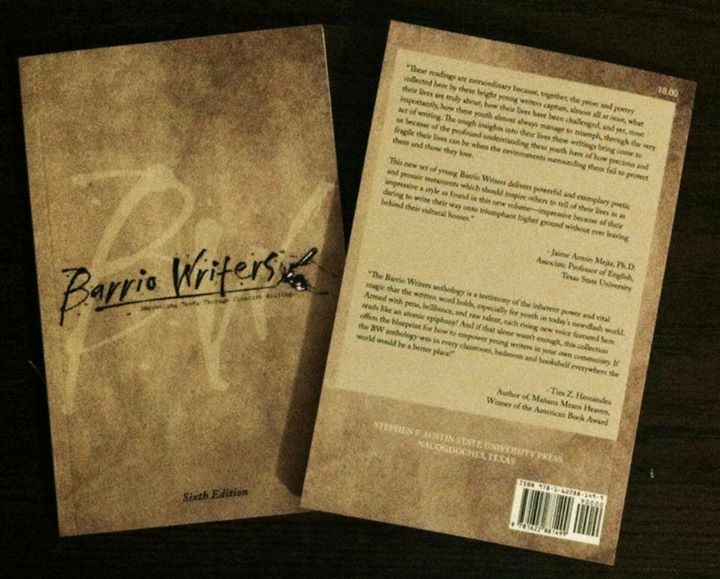 The Barrio Writers featured in the new book have attended various surrounding schools in Austin, TX, Phoenix, AZ & Orange County, CA and participated in the BW program summer 2014. Please join us in supporting our youth in showing the world that regardless of the obstacles & stereotypes placed on our teens, they find a way to have a voice and teach us all life lessons. Arts In Context is an arts documentary series exploring the process of creation through collaboration & the condition of living & working as an artist. By spotlighting visual arts, dance, music & culture, they hope to pique curiosity & inspire people to learn more about a subject, visit an exhibition, attend a performance or create & share something beautiful of their own & facilitate the dialogue between artists and audiences. They recorded the BW program in Austin during summer 2015. This event is co-hosted by Resistencia Bookstore & Center of Mexican American Studies at UT at Austin – we appreciate their community partnership in the arts & support for our youth. Sponsors are needed for snacks & beverages, if interested email [email protected] or visit our website for program details: www.barriowriters.org. Please make sure to park in the rear of the lot & enter through the second door of the lime green house from the front.